« Is an Article V Convention the Best Approach? So, is it hopeless to think that we might restore the Constitution by amendment? No, there is hope, if we revise the amendment process first. The “amendment amendment” resolves the barriers in the amendment process while still preserving the basic structure for amendment created by the framers. The Amendment Amendment will facilitate the amendment process in several ways, all while preserving the principle of super-majority approval of changes in our foundational document. First, it reduces the hurdles slightly, from two-thirds vote of Congress to five-eighths, and from three-fourths of the States to two-thirds (that’s 34 States out of 50 rather than 38). Super-majorities are still required, but super-majorities which are more achievable in our nation which is far larger and more diverse than the framers ever could have imagined. Third, Article V does in fact currently provide that amendment proposals initiated by a convention called by two-thirds of the States can be ratified by three fourths of the States without congressional approval. The “amendment amendment” also retains this possibility but eliminates the now unnecessary convention. These amendment procedures will solve the problems with the convention approach discussed in the previous post. Amendment proposals would not have to go through the States twice, once to call the convention, and again to be ratified. The amendment(s)’ initiation, by how ever many States participated to start, would also count as their ratifications. Most critically, the content and wording of the amendments could be controlled. 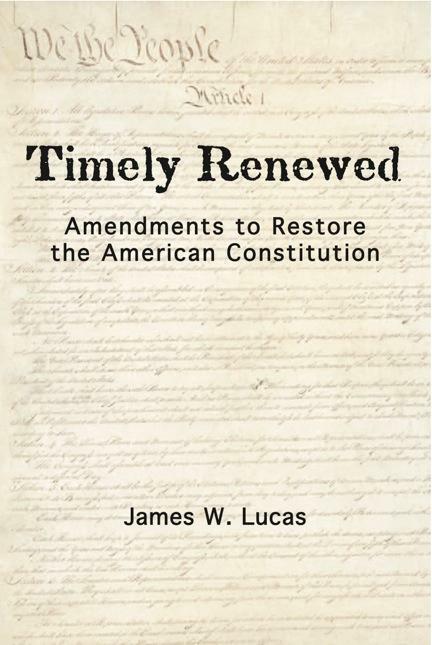 Rather than being subject to the vagaries of an ego-driven convention of politicians and law professors, the amendment(s)’ sponsors could precisely draft the proposals to strictly accomplish the restoration of the Constitution’s original meaning. Of course, the amendments would still have to be approved by state legislators. However, here is where the key difference emerges. Unlike a remote national convention, or our special-interest dominated federal Congress, state legislatures can really be amenable to grassroots activism. And it is in such grassroots activism that the real energy for restoring the Constitution is to be found.